I hosted a party / couples baby shower for two of our best friends. Each guest at the party wrote down an unconventional / inappropriate boy and girl baby name. The winning girl name was Cinnamon. I obviously had to make cupcakes for the new family after she was born. 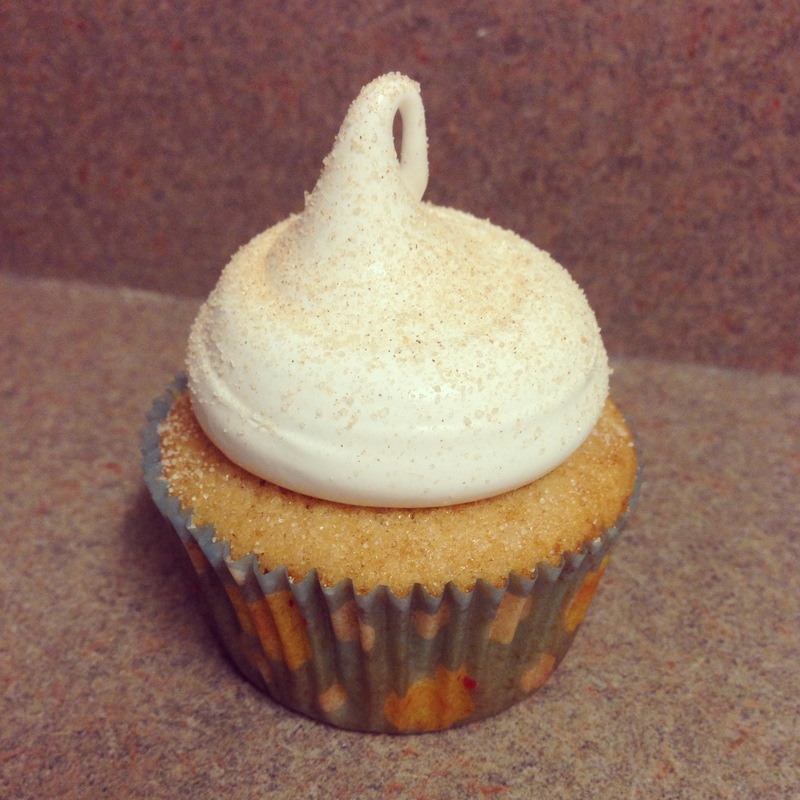 And what was a more appropriate flavor than the baby’s pseudonym, Cinnamon. 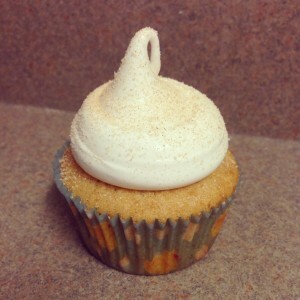 These are wonderful fall cupcakes. Seven-minute frosting can be tedious to make but is super retro and glamorous. 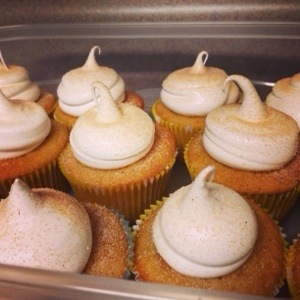 This frosting recipe was featured in the past with lemon meringue cupcakes. This is an improved version of the recipe. It will take a few tries to master this frosting magic, but you will be very glad that you put in the work. 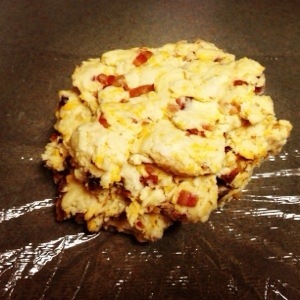 Preheat oven to 350 degrees and prepare two muffin tins with paper liners. In a medium bowl, sift together all-purpose flower, cake flour, baking powder, salt, and 1 tbsp cinnamon. Cream butter and sugar together in the bowl of a stand mixer until light and fluffy. Add each egg mixing until incorporated. Mix in the vanilla and reduce the speed to low. Mix in the dry ingredients mixture in three additions, alternating with the milk, ending with the flour. Beat in the flour and milk until combined with each addition. Scoop batter into the prepared cupcake liners, each should be three-quarters full. Bake for 10 minutes, rotate the pans, bake for another 10 minutes. Let cool in the pans for 5 minutes, then transfer to cooling racks. 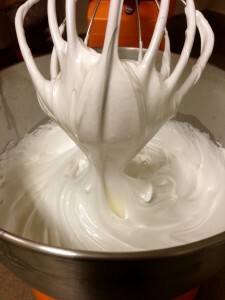 In the bowl of an electric mixer combine the sugar, corn syrup, 1/4 cup water, and egg whites. Set this over a pan of simmering water. Stirring constantly, cook for two minutes until the mixture is 160 degrees. With the whisk attachment, beat mixture on high until the frosting is fluffy and glossy, for 5 minutes. Mix in vanilla. What is missing from the title of this pizza is the bacon. I love bacon just as much as the next person. 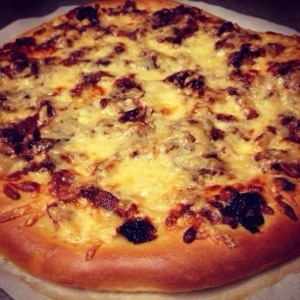 But I have to say the impressive flavor in this pizza is from the gruyere and the caramelized onions. But don’t worry, there is plenty of bacon. This recipe was inspired by an oh so fabulous restaurant, The Chef and the Farmer, in Kinston, NC. They have a pizza with these ingredients PLUS pork belly. It is intense. You could use pork belly for this recipe, but I always have bacon in the fridge so I used that. 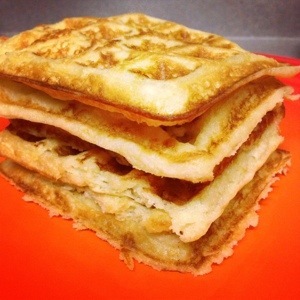 This recipe is guaranteed to impress. Ideally you will have a half recipe of pizza dough in the fridge or freezer ready to go for this recipe. There are so many wines that would complement this fabulous appetizer. But it is October and there is nothing better paired with football weekends and this pizza than Stella Artois Cidre. This is a much brighter hard apple cider than most other brands. 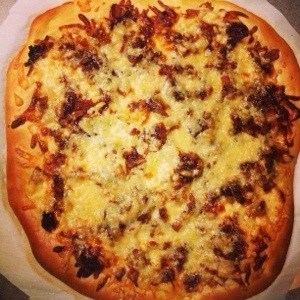 Th apple flavor complements all the ingredients in this pizza in an amazing way. The Cidre is very light with delicate apple flavor. Cook the bacon in a large skillet over medium-low heat. Cook the bacon until some of the fat is rendered but the bacon is not fully crispy (it will continue cooking in the oven). Remove the bacon to a paper towel. Leave the bacon grease in the skillet. Decrease the heat to low and add the butter to the skillet. Toss in the sliced onions and salt. Cover and cook the onions for 1 hour, stirring every 10 minutes. Then stir in the brown sugar and pepper and cook for 15 minutes more. Add in the minced garlic, cook 1 minute. Remove onions to a bowl. Roll out your pizza dough between oiled sheets of parchment to a 12 inch circle. (The parchment will make this easier.) 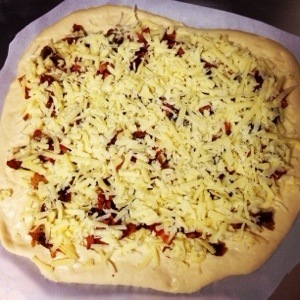 Preheat the oven to 375 degrees and remove the parchment from the top of the pizza dough. Allow the dough to rest for 10 minutes. Place the dough on a baking sheet. Cover it with half of the gruyere, then cover with onions, then sprinkle the bacon. Sprinkle with remaining cheese. Bake for 30 minutes or until the crust is golden brown. The pizza will slide right off the parchment, slice on a cutting board. Alternate method: If using a pizza stone, preheat oven to 500 degrees and bake for 10-15 minutes. 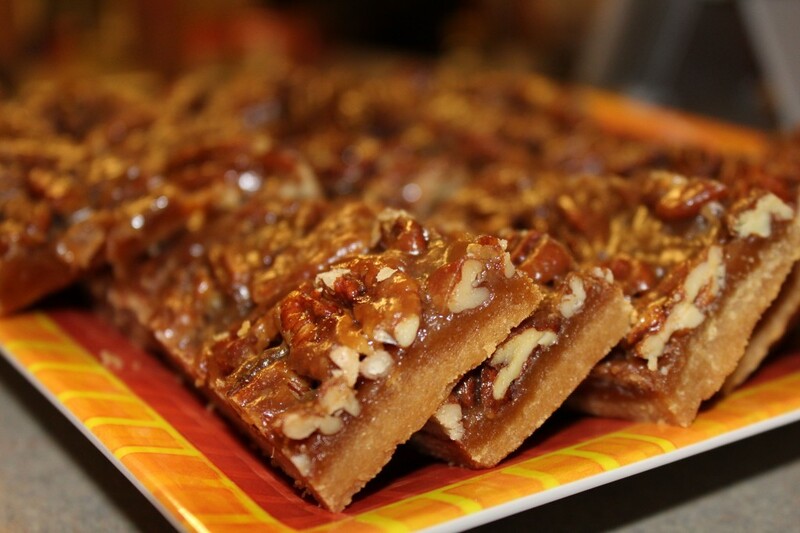 I will go as far to say that these bars are better than a pecan pie. And they are way easier to make than a pie! They also slice up so perfectly and transport well to any holiday party. Pecan is second only to pumpkin on the list of top fall flavors and this dessert is all about the pecans. Depending on what pan you use, you may need to shorten the initial baking time on the crust. A metal pan will brown the crust more quickly. Lining the pan with foil is an amazing trick that you can use for many recipes besides this one. You will lift your dessert right out of the pan and cleanup is so much easier. As far as dark brown sugar versus light brown sugar, I have not noticed much difference in my recipe results in the past. Only recently did I start specifying. 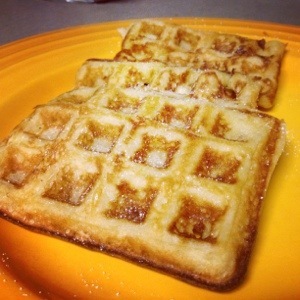 If light brown sugar is all you have, just use that. 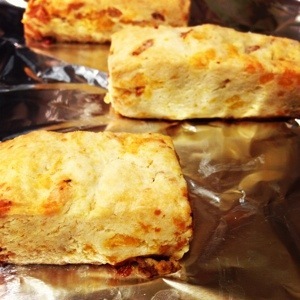 Take these to your next fall party with a few bottles of Southern Tier Pumpking. This is absolutely the best pumpkin beer. It is extremely smooth with a flavor close to pumpkin pie. It is not the easiest to find so if you see it, do not hesitate! Prepare a 9×13-inch pan by lining with foil, leaving enough for an overhang on all sides. Preheat the oven to 350ºF. Prepare the pecan filling. Combine the butter, brown sugar, honey and heavy cream in a saucepan on medium heat. Simmer the mixture over medium heat for 1 minute, add in the chopped pecans. Remove the crust from the oven. Pour the pecan filling over the hot crust. Bake for another 20 minutes. Let the bars cool in the pan and then lift them via the foil. 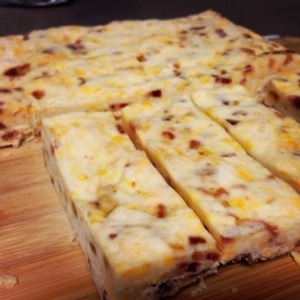 Slice the bars on a cutting board.